LEGO DUPLO Planes Skippers Flight School features hangar with decorated LEGO DUPLO bricks, flag, oil can, tool, pillar and other assorted DUPLO bricks. 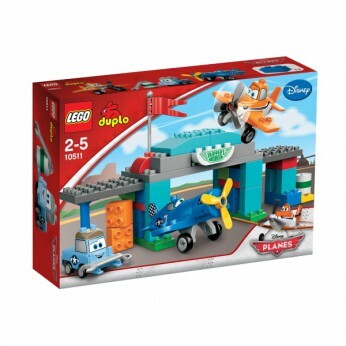 Includes LEGO DUPLO Skipper, Dusty and Sparky characters from Disneys Planes…. This toy costs approximately £29.99 (for the latest and best prices make sure you check our retailer list for the LEGO Duplo Planes Skippers Flight School 10511 above). In our review of LEGO Duplo Planes Skippers Flight School 10511 we classed it as being suitable for ages 3 years, 4 years, 5 years but recommend you check the manufacturer specific advice before purchasing.